Posted by jeremyliew in Entrepreneur, founders, start-up, startup. I’ve long held that two is a good number of (co)founders. One is difficult because you don’t have a true thought partner to talk to, or to tell you when you might be being crazy. To everyone else, you’re the CEO and the boss, and that power dynamic mitigates what they are willing to tell you. Three can lead to a “two on one” situation, which can be destabilizing. It doesn’t always have to be unstable, but it is a risk. Four or more and the equity cuts start getting pretty small for cofounders. Posted by John Vrionis in 2011, blogging, start-up, startup, startups, Summer Program, Venture Capital. There’s been some great discussions recently about the Lightspeed Summer Program (http://news.ycombinator.com/item?id=2380567) and at several of the sessions over the weekend at the Stanford E-Boot Camp (http://bases.stanford.edu/e-bootcamp/ so I thought I’d do a quick post to help answer some of the recurring questions. Background. I started the program at Lightspeed 6 years ago because as an undergraduate and graduate student I, as well as many of my entrepreneurial classmates, took on “real” internships during the summers in order to pay the bills (rent, gas, beer…). We worked on our startup ideas on nights and weekends out of necessity. When I joined Lightspeed in 2006 and realized that we had the resources to facilitate some number of idea-stage projects, we put together the Summer Program and opened it up to student led teams. Why did a student need to be involved? We had to draw the line somewhere. The program could not be just another entryway for entrepreneurs to pitch Lightspeed. We wanted to target young, entrepreneurial minded people and give them a viable summer alternative to taking that traditional internship. I know from personal experience just how hard starting a company can be. It’s a BIG DECISION to tackle early in your professional career. Pieces of the program have changed over time, but the GOAL has remained constant since inception and that is simply to give young entrepreneurs the time and resources to fully experience what it is like to start a company. Purpose. The Lightspeed Summer Program is NOT an incubator, nor was it ever intended to be. We are not looking to fund companies out of the program. Really. I promise. We want people to experience startup life fulltime and have the opportunity to learn if it is something they truly want to do. Is there benefit to Lightspeed? Yes, of course. We hope to build relationships with young, talented entrepreneurs at this stage in their careers. We are in the business of fostering entrepreneurship. We also have a very long term view on what this means. The opportunity to work with bright, energetic people who have ideas about how to change the world is exactly why we do this job in the first place. First, we don’t have expectations that the teams we accept will be ready for venture capital during or after completing the program. In fact, I’ve been surprised by the number (12+) that have gone on to receive venture or angel funding. Second, we look at the program as a way to engage with people at this stage in their careers. If we do a good job and they like working with us, they should want to come back and work together down the road if they want to pursue entrepreneurship. If we don’t do a good job, and they don’t like working with us, well, shame on us(! ), but the entrepreneur shouldn’t be obligated to work with Lightspeed. Evolution. I’ve changed the “rules” of the program over the years to try and make it a better experience. For example: I learned in Year 1 that teams without engineers didn’t accomplish much in the 10 week time frame. Without fulltime “doers” teams ended up with a lot of ideas and power point slides but very few actual results. So we adapted and started requiring that every team have at least one CS or EE major as a way to push teams to have members that could actually build stuff over the summer. Example 2: I learned that what is most helpful to the Fellowship winners in terms of guest speakers and introductions is other young founders who have successfully raised money and angel investors. So I changed our guest speaker lineup and invited fewer attorneys, CFO’s, and recruiters and went with a healthy dose of entrepreneurs, CEO’s and investors. Example 3: Entrepreneurs like lots of free food, so we added more snacks. Competition. People often ask or comment about other programs (YC, Angel Pad, etc). I’m thrilled these programs exist and are flourishing. I think the more opportunities out there for young entrepreneurs to try the startup life, the better. We’ve had teams in multiple summer programs in the past and its been great. The one requirement we ask is that teams dont participate in more than one program at the same time. Resources. The program gives Fellows office space, some funding, VC mentorship (each winning team has a Partner from Lightspeed as a mentor), introductions to founders and angels, and a chance to work on your idea fulltime. I’ve learned that our Fellows also benefit greatly from the camaraderie that emerges from working with other entrepreneurs in a close environment and that these lasting relationships mean a great deal to people. This program is NOT for people who want a lot of hand holding. As an entrepreneur, I learned you need to be scrappy. The program is designed to give you all the resources you need but ultimately it is best suited for entrepreneurs who just need the chance to make things happen. Posted by jeremyliew in Consumer internet, Digital Media, Internet, media, start-up, startup, startups. I think using CPM/RPM in this is a useful framework to think about strategy, but it isn’t necessarily the most useful way to think about howe well an online media business is scaling. In practice, most online media companies do not sell out their inventory through direct sales. Because direct sales generates RPMs so much higher than remnant inventory running through ad networks, the amount of direct sales is key. Direct sales shows real economies of scale. While it is harder and more expensive to sell, support and serve a $1M insertion order than a $10k insertion order, it doesn’t cost 100 times more. Unfortunately, many media startups find that their campaigns are primarily in the 10s of thousands. This creates inefficiency and makes it difficult to scale. It is hard to get to $50M in revenue $10k at a time. Right now, the key measure that I use to judge how well an online media company is scaling is by looking at quarterly revenue by advertiser. The more advertisers are spending over $100K per quarter the better. I like to see 10 or more advertisers spending over six figures per quarter. This shows that the site has grown beyond “experimental buys” and has become a core part of the advertising mix for a core set of advertisers. These sites are over the hump on scalability of their business as it is much easier to get repeat business from clients who are committed to the site, and to use these reference accounts to drive further sales growth. What do readers think about this measure of how well an online media company is scaling? Posted by jeremyliew in advertising, business models, media, startup, startups. In the heady days of early 2000, the megamerger of AOL and Time Warner heralded the web-based future of publishing. It would create a digital platform for Time Inc., the biggest, most-prestigious magazine group in the world. Needless to say, that didn’t pan out, and here’s where it gets ironic. Just as Time Warner is unwinding that mistake, AOL is figuring out the future of magazine publishing on the web. And it’s doing so without Time Warner’s content assets. The model goes something like this: Find a vertical with an audience attractive to advertisers, brand it (Daily Finance, Asylum, Lemondrop, Politics Daily), hire five to seven people to run it and plug in AOL’s traffic fire hose. Repeat. This reminded me a little bit of the continual tension in media companies caused by serving two constituents – readers and advertisers. AOL has clearly discovered one path to repeatable success, which is to start with the needs of advertisers. This is emphasizing the “media” part of new media. The new media companies that are doing the best in this recession have taken a similar approach. Companies like CafeMom, Flixster (a Lightspeed portfolio company) and Glam have focused on creating highly valuable inventory for endemic advertisers, and on building excellence in sales execution. In contrast, some other startups have focused on the “new” part of new media. They have often created incredible compelling experiences for users, and have generated impressive traffic. But their monetization ability has lagged; sometimes due to creating inventory that is hard to sell, sometimes because the startu’ps culture is not inimical to ad sales. Here in Silicon Value there can be a tendency to overemphasize product and technology and underemphasize ad sales. Advertising revenue often scales with ad sales people. Yet I have seen some startups that have been disappointed with their revenue growth but have >10% of their employees focused on revenue. Many new media companies based outside of Silicon Valley (especially those in New York) grasp this innately. For more in this vein read two prior posts; on the preeminent importance for sales excellence in ad networks, and on the three ways to build an online media business to $50m in revenue. Posted by jeremyliew in exits, M&A, start-up, startup, startups. 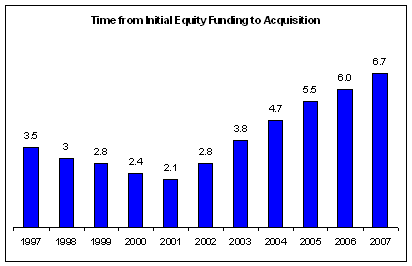 As you can see, companies sold in 2007 had seen almost seven years pass since their first financing. Often they were founded up to a year before they took their first financing, so they were likely eight years old when they were sold. These numbers are averages – some companies exit faster, but some exit slower as well. This data represents M&A exits. Usually the time to exit via IPO is even longer. Although no data is available yet for 2008, there has been virtually no venture backed IPO activity in 2008, and the number of M&A tractions is sharply down from previous years. That means that the time to liquidity is likely getting longer. Obviously, these are backward looking metrics (2007 numbers refer to companies that were sold in 2007, not companies that were started in 2007). However, founders of companies looking to raise venture capital should be ready for the long haul. You can’t start a company and expect a quick flip. Posted by jeremyliew in business models, Consumer internet, economics, start-up, startup, startups. 2. Business conditions for the next six months. 4. Employment conditions for the next six months. 5. Total family income for the next six months. In the most simplistic terms, when [CCI] is trending up, consumers spend money, indicating a healthy economy. When confidence is trending down, consumers are saving more than they are spending, indicating the economy is in trouble. The idea is that the more confident people feel about the stability of their incomes, the more likely they are to make purchases. As a point of comparison, the CCIs most recent peak was at 112 in July 2007. It is down by two thirds since then. The last CCI trough was at 61 in March of 2003, down from a peak of 144 in May 2000. This time around consumer are far more concerned than they were in even the depths of the last economic slowdown. Historical CCI stats are available here. All consumer facing companies, whether ad based or commerce based, should bear these numbers in mind when planning for Q4 2008 and for 2009. Posted by jeremyliew in advertising, start-up, startup, startups. * Ad network ValueClick Inc., based in Westlake Village, blamed the economy for a slowdown in display advertising, which led to a 6% drop in its second-quarter profit. This has two implications. The first is simply brand recognition. It is much easier to make the case to buy media on a well known site. As a result, scale matters. The leaders in both web 1.0 (AOL, Yahoo, Cnet etc) and web 2.0 (Facebook, Myspace, Rockyou*, Digg etc) will continue to see high demand for their advertising inventory. As the web 1.0 leaders are already at scale, they may see greater negative effects from the overall market, but there will continue to be a strong core of demand. Many of the web 2.0 companies have grown out their traffic and brand in advance of their sales forces, so they may be able to ride the growth of their sales teams to better mitigate the market effects. But being big (5m+ UU/mth), and a leader in your category, will help a lot. The second implication is that advertisers will continue to buy advertising against targeted content. Advertisers are used to buying content adjacencies. Targeting against users (whether behavioral or demographic targeting) can’t be counted on to lift CPMs in the next couple of years. Sites with highly targeted content that attracts endemic advertisers (Flixster*, iLike, Streetfire.net* etc) or demographic clusters (TMZ, PopSugar, AskMen etc) will be better off than broad reach sites. 2. Experimental budgets are the first to get cut. In an ad recession, advertisers appetite for experimentation is low. They like to stick to the established ad standards. New forms of advertising are hard. Startups whose sales processes feel more like business development than selling off of a rate card may have a tougher time. Companies selling standard ad units will weather the recession better than those that have unique ad units. 3. Marketers keep funding direct response advertising. Many analysts now agree that when marketing budgets come under pressure in a stressed economy, those sectors that can best document their connection to ROI, such as search-engine advertising, are far more attractive to corporate chiefs than other kinds of less-trackable traditional advertising. Direct marketers will continue to spend to acquire customers if that spend can be directly tracked to a sale. Lead gen companies (Quinn Street, Tippit*, LowerMyBills etc) will hold up better, as will companies with CPC and CPA models (Google, TripAdvisor, $uperRewards, etc). However, they may also be affected if the overall number of people “in market” goes down, or prospective buyers become less likely to buy, due to the overall economy slowing down. Who will have it toughest? Sites that are sub scale (<1m UU month), with no targeted content AND selling custom ad units are going to have to work the hardest over the next few years. Great teams always find a way, but the road may be long and hard. What are your thoughts as to what sort of online media companies will survive the ad recession best? FURTHER UPDATE: Which companies might benefit from an online ad recession? * Rockyou, Flixster, Streetfire.net and Tippit are Lightspeed Portfolio companies.